September 11th hit me a little harder than usual this year. I think it might have been a presentation that I gave to 180 college freshmen a few weeks ago—the way they looked at me as I told them my story about where I was on September 11th. I wasn’t presenting to a political science or history class. It was just a one-credit first-year class for undecided majors. Just a slot in their schedule to hear about different topics to get them thinking about what they might want to do in the future. Because I work with the international student population at my university, I offered to speak to them about the importance of intercultural competence. As I planned that presentation, I thought about these college freshmen. What I could possibly say to make them understand why communicating with people from other cultures is important? I thought about my own college experience. I had no international friends. I didn’t even really know any international students on campus. I was in college from 2000-2004—an all-time low for international student enrollment, since the U.S. practically closed its borders after September 11th. How old would these students have been in 2001? Four or five years old. Good grief. They don’t even remember it. And that was when I decided that I would tell them how I—as a sophomore in college—learned the news of the terrorist attacks and how I had reacted. Because they could see themselves in my shoes, as a young college student. I would tell them that I didn’t watch the news that morning. That I didn’t even check my computer. That I had walked all the way to my 9:30 anthropology class, only to be told by my professor that two planes had crashed into the World Trade Center. That he didn’t know what else to do besides teach class. That I had tried to get lunch after class, only to walk away from the dining hall, sick with worry as I listened to the news being played over the loudspeakers. That I couldn’t call my parents because I didn’t have a cell phone. That I sat in a French class while my classmates–strangers that I had only known for three weeks–cried together and raged about those people throwing candy and dancing in the streets—and how another classmate defended those people by pointing out that they were Palestinian—and their homes had just been bulldozed by American tanks. And the fact that this heated and tearful debate had pushed me to think. Why are people angry at us? I said all of this. It was a powerful, emotional speech that froze all 180 of them in their seats for a solid nine minutes—no easy feat in the age of the smartphone. But after all 180 of them had filed out of the lecture hall, I was bothered. Could they ever really understand? They don’t have the emotional memories that I have. And that’s not their fault. 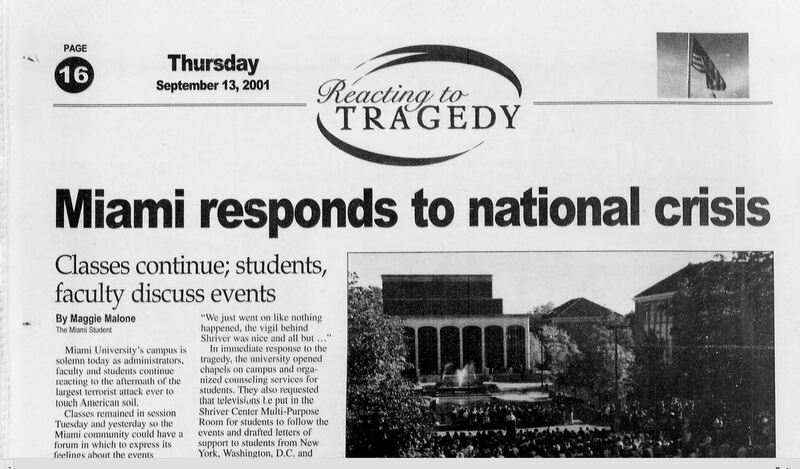 Just as I barely remember the Challenger explosion—which happened when I was five—these students wouldn’t really remember September 11th. For me, after the dust had settled, what September 11th left with me was a profound sense that I didn’t understand everything. Perhaps I knew this intellectually, but as I watched the coverage of the United States turned upside down and inside out, I started to feel the limitations of my own understanding. Anthropologists call this phenomenon “strange-making” and it is a key element of rituals of transformation. To see your world turned upside down and inside out shatters your mental constructs and forces you to accept that anything is possible. 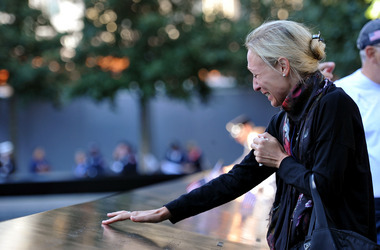 Like many Americans, I was transformed by the experience of September 11th. It ignited in me an insatiable curiosity about how the United States looks through the lens of other cultures. That curiosity compelled me to ask questions, to change my major, and to volunteer to teach English to adult immigrants. That curiosity brought me into contact with people from all over the world. And through that contact, I have had the great privilege to vicariously experience the world through a kaleidoscope of different cultural lenses. My curiosity sent me abroad, and it was through those experiences that I was able to feel culture. Culture was no longer a bolded word in a textbook. Culture became as big, as pervasive, and as powerful as God. And I began to understand just how different my culture was from French culture, Chinese culture, Turkish culture, Saudi culture. And that within these monolithic “cultures,” there is incredible diversity that I cannot begin to fully comprehend and articulate to others. I feel humbled and blessed to not only have understood this in my lifetime, but to live it every day as I teach international students. At the same time, it bothers me. It bothers me that I cannot simply just pass on genetically what I have learned. It bothers me that although I can pass on my eye color and my stubbornness to my daughter, I cannot pass this on. My daughter will still have to learn all of these lessons for herself. There is even the possibility that she won’t learn these lessons—just as I haven’t learned all the lessons that my father wanted to pass on to me before he passed away. 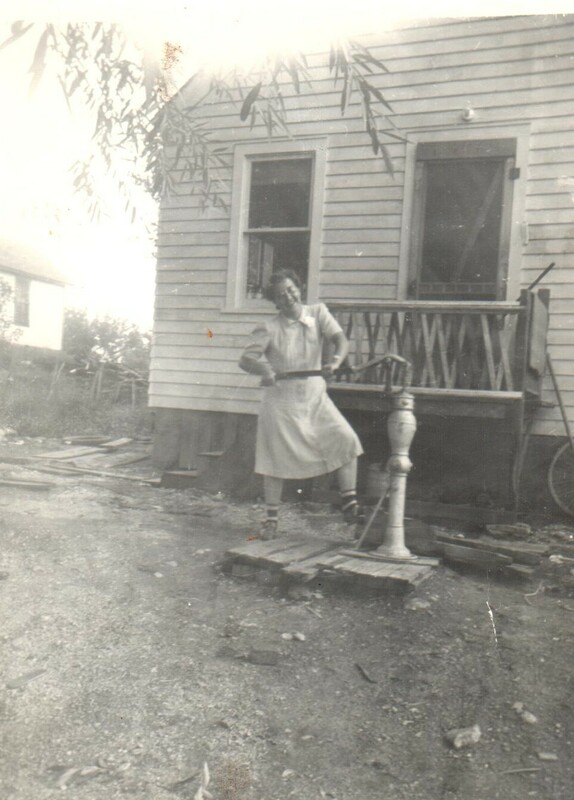 In the span of American history, I’m sure it bothered many women of my grandmother’s generation that they couldn’t transplant into their grandsons their own emotional memories of watching their fiancés and husbands go to war halfway around the world–as a kind of antidote to war-hungry men. Just as the mothers of the Civil War couldn’t recreate for their grandchildren the grief of not being able to bury their sons who had died hundreds of miles away. I’m sure plenty of great Americans went to their graves hoping and praying that someday their grandchildren and great-grandchildren would realize all that they had sacrificed for us so that we may live better lives. But we can’t pass this on. Because what we want to pass on is hunger. Hunger is felt individually. It emerges from an emptiness, a realization that something is lacking. Hunger cannot be taught. It is felt. Hunger drives us out of our safe havens and sends us searching. Too often in American parenting, the goal is to ensure that our children want for nothing. We believe that “providing all that our children need” is the hallmark of good parenting. We can’t provide everything our children need. Just as good teachers acknowledge that teaching isn’t just transplanting knowledge into a student’s brain, good parents acknowledge that parenting isn’t just telling our children what to do—it’s letting them experience so the lessons stick with them. But with September 11th, my daughter cannot share my experience. There’s no recreating it. While the emotional part of my brain never wants my daughter to feel the way that I felt on that day, the rational part of my brain craves that experience for her. I want her to reach the limitations of her own understanding. I want her world to be turned upside-down. I want her to go searching for answers—and then to keep going when she realizes that there is no end to answers. I want her to feel hunger. The hunger that will send her searching. And if I’m always trying to make sure that my daughter is “full,” when will she ever be hungry? Nutritionists will tell you that it’s not healthy to never feel hunger. Our bodies work best when we allow enough time to pass between meals. Our stomachs speak to our brains and our brains speak to our stomachs. The same is true of our emotions. We cannot make it our goal as parents to create a life that is always “happy” for our children. Our children need to learn how to experience sadness, frustration, anger, embarrassment, guilt, disgust, and everything in between. When our emotions emerge, we need to make sense of them. We need to feel them so we can move through them. When we numb ourselves to our emotions, we lose our humanity. Not only that, but we lose the ability to remember, for emotion is a powerful vehicle to transfer experiences into long-term memory. Emotion creates an authentic context. It makes those threads in the web of our memory particularly sticky. And as I stared out at those 180 eighteen-year-old faces, I saw the truth that September 11th had not stuck to them at all. They had come through those years having no emotional memory of that day. They were unchanged by this day in our history. But as they listened to my story, their faces darkened. Their foreheads furrowed. They froze in their seats. You could hear the proverbial pin drop in the back of the room in the pauses in my speech. Telling my story had given them that an authentic context. It had allowed them to vicariously live that day with me. It had given them a reason to pay attention. It had shown them the value of what I was telling them. I love stories for this very reason. They can provide the emotional context that we need to help others who do not share our experiences. So although we cannot pass on our hunger, we can pass on our stories. We cannot know how they will receive our stories, but that’s not the point. The point is that we tell them. The point is that we give them the context. Then, we hope that they listen. And we pray that they learn.